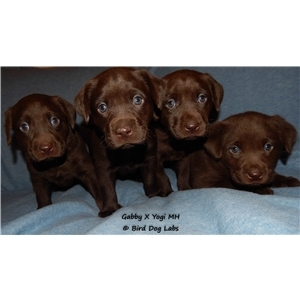 Outstanding chocolate litter selectively bred for the field and home! 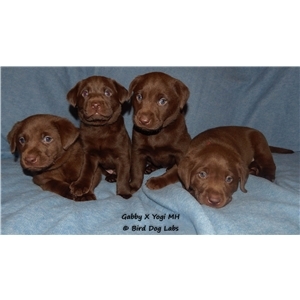 Bird Dog Labs LLC is proud to announce this outstanding all chocolate litter born December 8th! 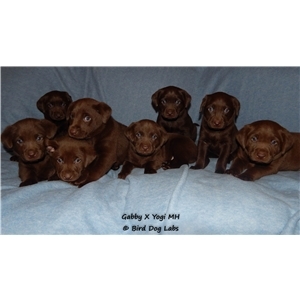 This is an amazing all chocolate litter that should produce the total package! These puppies are bred for intelligence, natural ability, train ability, health, family friend temperaments and phenomenal good looks! Not to mention a rock solid pedigree! They will be ready to go February 2nd when they turn 8 weeks old. These puppies will be excellent for serious hunt test, hunters, SAR, various types of working homes and also active family homes. Males and females available. We are an AKC Breeder of Merit and AKC Bred with H.E.A.R.T. Breeder. All of our puppies are born and raised in our home and go through our comprehensive puppy starting program. We do everything we can to ensure that each puppy is given the best start possible. Our puppy starting program includes at a minimum; early neurological stimulation and early scent introduction between days 3 and 16, daily individual handling and attention, introduction to wings/bumpers, introduction to crates, introduction to car rides, obstacles, different environmental terrains, gunfire from a distance, daily loud noises in the house, water weather permitting and thorough socialization with kids, adults and safe dogs of various ages. We do our absolute best to give each puppy an excellent start! All of our puppies are vet checked at 3 days and 6 weeks of age. They have their dew claws removed, dewormed appropriately, 1st round of vaccinations, individual health certificate from board certified veterinarian and are microchipped. 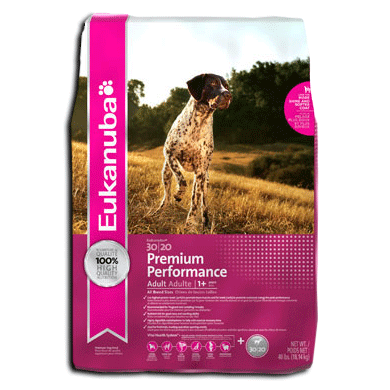 We offer a 30 month hip/eye warranty and Lifetime guarantee to never be affected by 15 different genetic diseases found in Labrador Retrievers. Yogi is a very handsome, solid 70-75 pound dark chocolate male. He is a quick study and earned his Master Hunter title as a 2 year old. Yogi loves everyone he meets and is extremely affectionate. He lives in the house and is a cherished member of our family. Yogi is a proven producer of puppies that are great in the field and can turn it off in the home. Yogi has an incredible old blood pedigree. He is the son of FC Nan-Dool Elwood Blues and Rebel Ridge Jamaican Me Crazy MH. All four of his grandparents are FC AFC titled, 2 of which were also National Finalists. Gabby is a very cute and stout medium-dark chocolate. She weighs about 55 to 60 pounds and is built like a tank. She has a shorter stature, but is very muscular and strong. Gabby is a higher drive female and loves to get out hunting. She is fearless when it comes to difficult cover and has the determination to always get the job done. Gabby is a very fun waterfowl hunting dog and upland hunting dog (primarily grouse). Gabby is excellent in the house and loves to get attention or go lay down and chew on a antler. She gets along with everyone she meets and is frequently called our social butterfly. Shipping can be arranged for cost. We post regular pictures on our Bird Dog Labs LLC Facebook page so you can watch the puppies grow before they are ready to go to their new homes. Accepting non-refundable deposits to hold picks!